Getting Internet Sharing from Ubuntu 18.04 to Bela.io? Ok, so I have an Ubuntu laptop with Wi-Fi, to which I attach a Bela.io; I'd like the Bela to use internet from the Ubuntu laptop's WiFi, through the USB connection. I tried the above first with Ubuntu 14.04, but I couldn't set up the network connection to both be "Shared to other computers" and have a fixed IP of 192.168.7.1 - this turned out to be fixed in newer Ubuntus (see https://askubuntu.com/questions/609645/configure-connection-sharing-with-specific-ip-address), so I upgraded PC/laptop to Ubuntu 18.04. ... however, I was thinking - since I had confirmed the above approach working, on the same laptop and Ubuntu 18.04 OS - but with a Bela with an older image; - it must be something in the new Bela image, that sets up the connection differently from Bela's side: say, maybe a different, random MAC address is used? (I should note that I tried specifying a fixed MAC address from Bela's /etc/network/interfaces by adding hwaddress ether DE:AD:BE:EF:CA:FE under iface usb0 inet static, that didn't help. 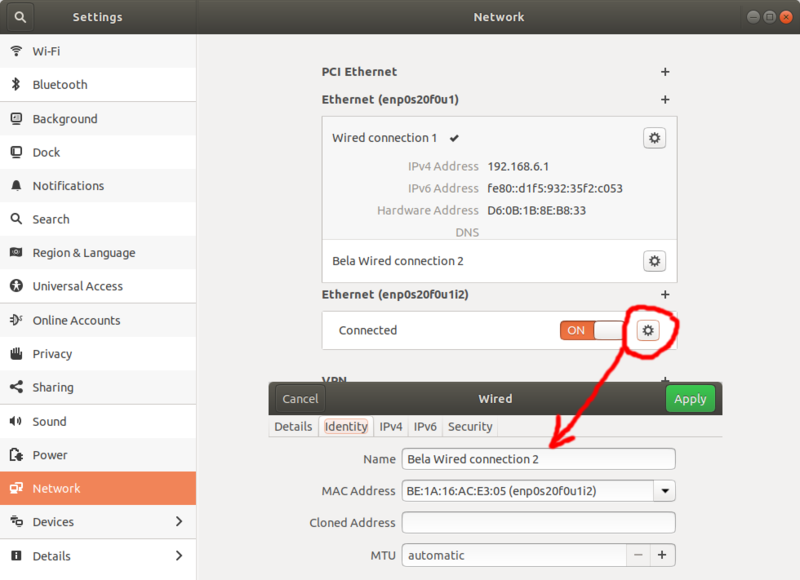 Also, as I see it, this is the MAC address by which the Bela.io will see its own usb0 network connection - not necessarily the MAC address that the Ubuntu PC/laptop will see, once the Bela has been attached to it?). Or, maybe some other parameter is changed, other than a randomized MAC address? I'm guessing this probably has to do with something related to RNDIS on the Bela, which I hear of the first time today, so I don't quite know it. Would anyone know, what could I possibly do on the Bela, so that when it is attached to Ubuntu 18.04 PC/laptop, the Ubuntu will note that this is the same device as the one in an earlier network connection, thus ending up using this earlier network connection, instead of creating a new one? 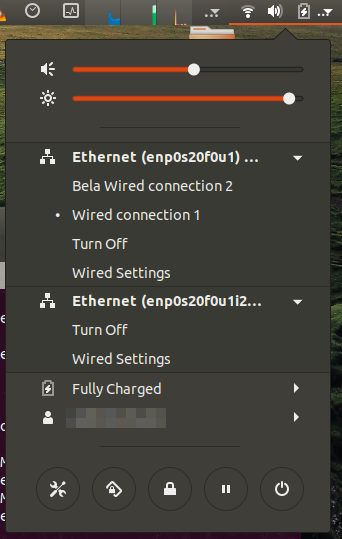 From Gnome panel menu, where it says "Ethernet Off", choose and click on "Wired Connection 2"
From within Bela's shell, do ip route add default via 192.168.7.1 -> and connection to internet should be established! PING yahoo.com (98.137.246.8) 56(84) bytes of data. Many thanks for the response! ... so older than v0.3.5a - but, with a ./scripts/update_board -y from a Bela git folder, done this past friday (updated to latest master via git pull). Does the update possibly take care of this bug - or should I try to burn a new image on SD card, say v0.3.5b then? Just wanted to post an update: recently I performed a full update to "Bela image, v0.3.6b, 23 October 2018" - including both flashing the SD card, and flashing the eMMC (using the Beaglebone eMMC procedure). 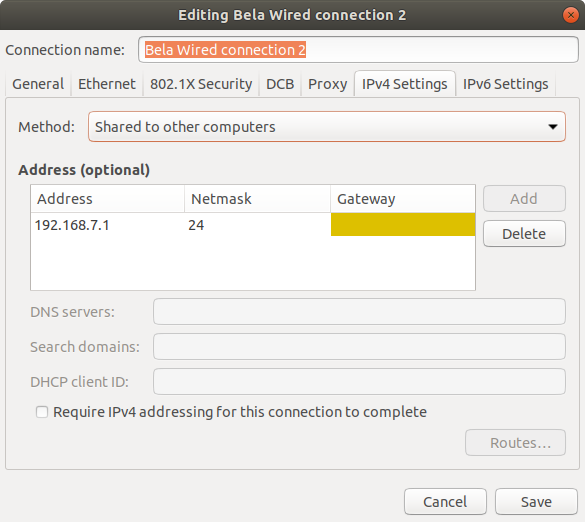 Now I don't get just one, but two network connections in Ubuntu when I connect the Bela !? EDIT: if you don't see these two after plugging in the Bela (and you see the two connections in ifconfig), its possible it is a Gnome desktop UI hiccup, so restart it with Alt+F2 and just r as a command. ... and now, saved like this, I can just ssh to 192.168.7.2 after Bela boots, and internet on the Bela is but a ip route add default via 192.168.7.1 away. sdaau Now I don't get just one, but two network connections in Ubuntu when I connect the Bela !? It's a feature! One of the two (the on that ends up having 192.168.6.1) is recognized without drivers on Windows. The other (the one with 192.168.7.1) is recognized without drivers on macos. So by having them both we can have users from both operating systems to have the board up and running without need for drivers. Linux of course is more reasonable and sees them both. Ah, that makes sense indeed! I was otherwise thinking I'm "seeing things" (as in, maybe my image download was corrupted, or something) - good to know it is intended And needless to say, I'm very glad now the Internet Sharing thing can be saved again!